Another brick falls | hear.here. Over the past several months, I’ve been in a pretty bad depressive funk, including more social anxiety than usual and having to talk myself out of panic attacks every day before I start work. It hasn’t been easy, and I’ve been dealing with it and seeking treatment. But one thing I have always believed heavily in is the power of positive thought. This weekend I was reminded how much anxiety stems from my hearing and how fabulous, positive people can break through to me. Back when I was a kid in the hospital in early 1989, awaiting my Crohn’s Disease diagnosis, a song came out that had a really great message and a great video with a really cute dancer in it. On one of my doctor visits (which always included a trip to the mall, since they were in the same city and an hour away from home), I picked up the album on tape to listen to on my walkman. I wore that tape out in the hospital to the point where later that summer once I was getting healthy again, I bought the CD. That was Debbie Gibson’s “Electric Youth” album. When you’re just a kid, and you feel like you quite literally might be dying, lyrics like “don’t underestimate the power of a lifetime ahead” and “the future only belongs in the hands of itself” can really help you get through it all. From that moment on, I was a true Debhead. When her third album “Anything Is Possible” came out the next year, it was full of positive messages (and another video featuring that cute dancer), and as I discovered later as an adult, she had been dealing with her own issues with anxiety and panic attacks (more on that in this video). There was one song, the opening track on the album, “Another Brick Falls”, that really spoke to me – not only was it catchy and had a killer piano solo (pretty much my favorite thing in a pop song), it had lyrics that were all about the struggles in pulling yourself up when you feel like everything has come crashing down. A feeling I dealt with very consistently with my hearing loss that ultimately led to my decision to get a cochlear implant. Fast forward to this weekend. 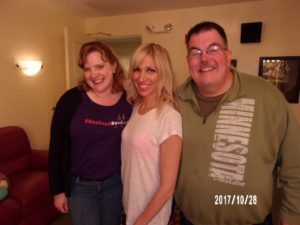 I bought tickets for a Debbie Gibson concert in Chicago several months ago. She hasn’t been performing all that much lately given her own work to overcome a chronic illness, and it had been 10 years since I last saw her. I was going to meet up with some other longtime Debheads, only one of whom I’d met before. At the last minute, my friend Mike – a fan I knew from 20-some years ago – decided to go with me and we were going to meet for dinner. I somehow fashioned that dinner into being 12 people in the end! Talk about social anxiety! Saturday morning came and I was absolutely dreading it. I did not want to leave my house, sit in the car for 3.5 hours by myself (very grateful for the new a-ha unplugged album for getting me through that! ), meet up with strangers, and go to a concert in a place I don’t know surrounded by a huge crowd. I was afraid of how I was going to hear to have conversations in a loud restaurant, how I was going to hear the show, etc etc. Mostly stupid, unfounded fear, but anxiety isn’t usually rational. So I went. And had the most amazing time I’ve had in a long time. The thing is, when you’re a positive person like Deborah, you attract similar people as your friends and your fans. Every single person I met Saturday night was a friendly, happy, incredible person, and I am grateful to every single one of them. 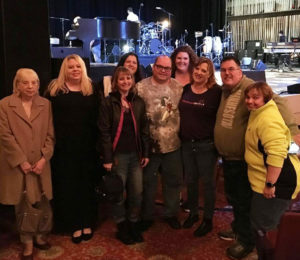 After the show, the Debheads and I were all just in awe – I don’t think any of us were expecting something so wonderful. We knew the likelihood of meeting Deborah afterwards was pretty high – a couple in our group were very well-known fans and one (Ricky) was texting with said cute dancer. There was a little anxiety there too – what do you say to the person who has had so much influence on your life? I’d met her before, once, in 1995, but now she knows who I am. We’d corresponded on Twitter and she read my story about my hearing loss and even became a donor to Hear Indiana in the last few years, which is ridiculously awesome. And then there was that cute dancer, Buddy, and his cohort Eddie, both of whom I’ve been Facebook friends with for awhile but had never met (or seen dance!). That cute dancer Buddy, me, and Eddie, whose smile makes everything better. Again, absolutely no reason whatsoever for anxiety. The instant Eddie saw me and broke into a huge, adorable smile and came up and hugged me, all anxiety was gone and I just felt loved and appreciated. Never underestimate the power of positive people! I had a lovely chat with them all, Deb and Buddy both recognized me the same way Eddie had, and it was just so great to connect. 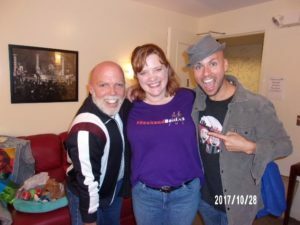 I talked about how great it was to actually HEAR the show and how that’s a first for me – although, I realized later that wasn’t quite true. Fully hearing Ali did go to Deb shows in both 1995 and 1997 – but that was a lifetime ago and I was very much a different person. The times I’d seen her perform as an adult were all muffled, hearing aided shows. So this was quite different. I got every instrument, every nuance, every word she spoke! I know so much of my social anxiety is caused by years and years of being afraid of not being able to hear or participate in conversations. My brain hasn’t fully recognized yet that those days are over – that now I’m usually the person in the room who is hearing the best! Thank you so much to Deb, Buddy, Eddie, Mike, Ricky, Melissa, Erica, and all the Debheads for helping me come back to a positive place. Ali thank you for inviting me to join you Saturday night. You are very Awoesome! of course! thanks to you and Leslie for staying and chatting. Love this and you so much! This just brought a huge smile to my face! Thank you. your smile is the BEST, my friend!